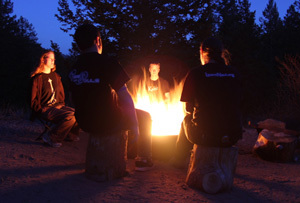 The 2015 AvatarMeet camping trip will start on Saturday, July 18th and run until the morning of Wednesday, July 22nd. Saturday the 18th will be the "arrival day", and will serve as a buffer day for people who may be taking a late flight or people who experience a travel delay. Tuesday night will be the last night at the site, and we will depart early Wednesday morning to meet the others in Estes Park. If you wish to attend the camping trip, you will need transportation to the campsite and back to Estes Park. There will be several people with cars who will probably have space to accommodate some people; we will be implementing a transportation column to the website (like last year) to assist people in finding transportation, and we will be willing to help people find rides, but it is important to note that it is ultimately your own responsibility to find transportation to the campsite. In addition to camping in his back yard Markì is willing to offer his cabin to a limited number of people who would either prefer a cabin to tent camping or do not have a tent. Contact Markì if you have questions, but it is important that people who have the necessary equipment and want to come camping bring a tent so that anyone who would need the cabin can make use of it. Some possible activities include a visit to some natural hot springs, a superfund site (http://en.wikipedia.org/wiki/Summitville_mine), sand dunes, night hikes, swimming, and more. We'll be providing food, but for the sake of efficiency and avoiding food waste, all attendees will be responsible for their own snacks and drinks (other than water). We'll be providing breakfasts, lunches, and dinners, plus s'mores for the last night, but anything else will be up to the attendees. We will also be sure to provide vegan/vegetarian/allergen-conscious meals for those with specialized dietary preferences and/or food allergies. Make sure that part of your profile is up to date if you have any special dietary needs! Please check and update your profile so we can have an accurate count of the number of people attending. If you have any suggestions or questions just ask on the forums. We have group discussions on IRC every so often.